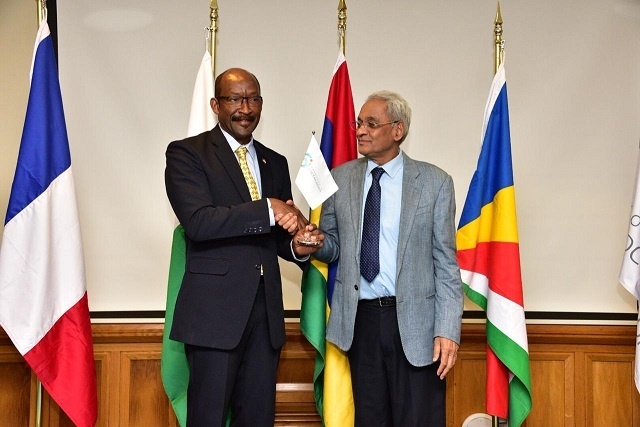 (Seychelles News Agency) - Maritime security, development of the Blue Economy and modernisation of the Indian Ocean Commission are areas that Seychelles will focus on as the country takes up the presidency of the regional body. The Indian Ocean Commission -- an intergovernmental organisation set up in 1982 -- includes Seychelles, Madagascar, Comoros, Mauritius, and Reunion, a French Overseas Department. Seychelles assumed the presidency of the Commission at the 33rd ordinary session held in Mauritius from September 11 to 12. The presidency is rotated every year among the members of the commission and the country which gains presidency continues the work that the predecessor was doing. Meriton said there are around 20 projects aimed at reinforcing security in the Indian Ocean, a process that he described as needing the collaboration of all member countries. Some of the projects concentrate on the protection of coastal zones as there is the need to incorporate cooperation with other African coastal countries such as Tanzania and Kenya. The commission is looking at the possibility of including more technology into Maritime security. “Deploying an airplane for surveillance is expensive, so the more we integrate modern technology the cheaper it will be. Drones will help us achieve that,” said the Vice President. Facilitation of commerce between member countries is another area that Meriton hopes that the commission works on during his one-year mandate. “We need to ensure that all sectors function to great heights and that the environment is propitious, allowing business to take place and that there are commercial exchanges between countries of the Indian Ocean,” he said. At the 33rd ordinary session of the Council of Ministers in Mauritius last week, a new programme under the project Ecosystems Improved for Sustainable Fisheries (EcoFish) was signed between the commission and the European Union. Under the Ecofish programme which will cost around $32.7 million, sustainable fisheries will be managed in the Indian Ocean.